Can I change the kit setup in the finals? The running order of the finals are planned down to the minute and there is simply no time to change the standard five piece set-up for each individual. You will of course be able to adjust heights to suit you (there will be a tech to help you with this), but you must use the five piece kit as it’s supplied on the day. 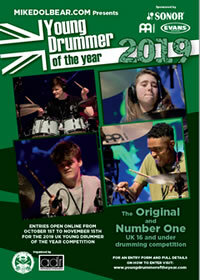 Winner of the Young Drummer of the Year 2019! Thanks! Please now check your inbox or spam folder to confirm your subscription.